D3publisher takes the award-winning combination of roleplaying game and gem-based puzzler and brings it to the iPhone with Puzzle Quest: The Battle of Grulkar. Rather than release the entire game in one large chunk, D3 and TransGaming instead decided to split the original Puzzle Quest and its expansion, Bane of the Plague Lord, into three more manageable chunks, releasing the first one with a lowered level cap on Apple's iTunes App Store for the premium price of $9.99. Does the price match what is essentially one-third of a much larger title, or are players better off playing the versions already released on consoles and dedicated gaming portables? The Game Remains The Same: This is still the same Puzzle Quest that I've played through a dozen times, with an extra shot of touchscreen support. The combination of jewel-matching puzzles with roleplaying game concepts like spells, experience points, and stats is just as compelling and addictive as it was the first time I got my hands on the Nintendo DS version of the game. A Nice-Sized Chunk: Despite being only half of the original Puzzle Quest: Challenge of the Warlords game, The Battle of Grulkar still manages to deliver a great deal of gameplay for a relatively modest price. You not only get half of the main quest, which is a god 18 to 20 hours worth of puzzle battles, you can also continue playing once the story ends, leveling up to 25 (the original cap was 50), conquering cities, capturing monsters, and developing new items and spells in preparation for the release of part two. Big Fingers Need Not Apply: The main issue with the porting of Puzzle Quest to the iPhone is that the menus and indeed playing the actual game itself can be frustrating with the tiny touch targets presented. While touching worked on the Nintendo DS with a stylus, having to hit impossibly small menu buttons with the tip of your finger, especially with fingers as large as mine, gets old fast. The game seems a bit more forgiving in terms of actually moving gems during battle, but you still have to play pretty close attention to what you are doing in order to avoid screw ups. A lot have fuss has been made over the price of Puzzle Quest: Grulkar, which gives you half of a $14.99 game for $9.99. At first glance it seems like a bit of a rip off, but when you take into account the fact that TransGaming has included the four additional classes that so far have only appeared in the Xbox 360 downloadable expansion Bane of the Plague Lord, which was included in the recently released PlayStation 3 version. With D3Publisher having confirmed that the next two installments would be at a lower price, it isn't quite as bad a deal as people had feared. For those of you who've not yet experienced the sublime melding of roleplaying and puzzle genres that Puzzle Quest delivers, Puzzle Quest: The Battle of Grulkar is still one hell of a game, and the perfect title to hide on your strictly-for-business iPhone. 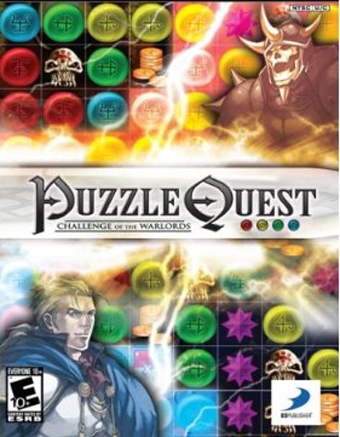 Puzzle Quest: The Battle of Grulkar was developed by TransGaming and published byD3Publisher, released on December 23rd, 2008 for iPhone and iPod Touch. Retails for $9.99. Played game once to completion. Reviewed version 1.1.